Yes 2015 has given us some of the most exciting cars to look out for, but if you are still not been able to find the right car for you so hold on as the second half of 2015 may have some surprises for you. Maruti Suzuki S-Cross - Maruti Suzuki doesn't have any crossover or SUV in its current line-up, but that will not be the case now. The company is planning to bring a sub-compact SUV and a crossover - the S-Cross - in the Indian market. Of the two aforementioned products, the SX4 S-Cross will come first. It will be launched as early as August 2015. Hyundai Creta compact SUV - The next all new product from the South Korean carmaker will be the much-awaited Creta. The car has already been launched in Indian market & has got the much required buzz within the market; Creta will take on the likes of Renault Duster, Nissan Terrano and the Maruti Suzuki S-Cross. Taking its design cues from the Santa Fe, the Creta is based on the company's evolved 'Fluidic Sculpture 2.0' design philosophy. Measuring 4270mm in length, 1780mm in width, 1630mm in height, the car is slightly smaller than the Duster. Renault Kwid – This is yet another most anticipated car of 2015 which is yet to be launched in September 2015. The small hatchback is built on the CMF-A platform that has been jointly developed by Renault and Nissan. Upon its launch, the Renault Kwid will take on the likes of Maruti Alto 800 and Hyundai Eon. Ford Figo Aspire – The prototype & concept of this one was unveiled by Ford in February 2014. This one was first launched in the Brazilian market as KA+ sedan last year. The Brazilian version of the sedan measures over 4 meters in length, though the India-bound model will be sub-4 meters in length, and thus will take on the Maruti Swift Dzire and Honda Amaze. Ford Endeavour - Unveiled earlier this year, the new-generation Ford Endeavour will go on sale in several markets this year including India. The new-gen model will be based on Ford's Edge design philosophy and will be more up market than its predecessor. In order to improve the vehicle's off-roading capabilities, the company has built it on a new ladder frame chassis. What's also new is the new terrain management system (TMS) that allows a driver to select among pre-adjust settings (normal, snow/grass, sand and rock) while driving. Here you go guys we hope these super cars yet to be launched will surely be the right car for you, if not than you can have a look at the widest range of second hand cars in Mumbai at Shriram Automall India Limited (SAMIL). Here you can find pre-owned cars of all makes & models ranging from a basic model to luxury cars at the most competitive prices. What’s So Unique with Shriram Automall’s Bidding Platforms? While India bids on its dreams, we at Shriram Automall create an unmatched bidding experience through our multiple bidding platforms. Here are a few unique features of our bidding platforms, through we get an edge in catering to your any need related to pre-owned vehicles and equipment. The two wheeler segment of Indian Automobile Industry has always been a driving factor for the growth of the overall industry. FY 2014-15 too belong to the to the two-wheeler segment that helped the industry record a marginal growth of 3.90 per cent in the domestic sales. Hero Dash 110cc - Hero MotoCorp, which has been the leader of the Indian 2 Wheelers market since time immemorial, is working on two new scooters for a launch in near future. Hero MotoCorp has still not announced the launch date of Dash 110cc, however, our guess is that it could be introduced around this year’s festive season. Honda CBR500R - This motorcycle is the fully-faired version of the CB500F & is powered by the same 500cc twin-cylinder liquid-cooled DOHC engine. The bike looks very sporty and offers a riding position that is not too aggressive. The bike is still not launched in India, however speculations are that it will be launched later this year. Yamaha YZF-R25 – The prototype of this bike was first showcased in 2013 at the Tokyo Motor Show, however the bike has been developed on a completely new chassis and sports a liquid-cooled 250cc inline two-cylinder engine. Its features certainly make it a superbike which you can ride every day. New Bajaj Avenger – The new model of famous Bajaj Avenger is expected to be launched late this year or early next year. Rajiv Bajaj recently announced that the new model 2015 Bajaj Avenger launch will take place in this fiscal, and our guess is that the new bike will go on sale in the first quarter of next year. TVS Apache 200 – We know how much you have loved the TVS Apache & we also know that you are super excited for the launch of its new model Apache 200. The launch is scheduled between the next quarters. If you are looking to acquire or dispose pre-owned bikes or scooter then Shriram Automall India Limited (SAMIL) is the right place. It offers the widest range of second hand bikes & scooters line up across the country, with over 50 well structured Automalls pan India SAMIL has become the trust mark of all. The used cars market in India is booming at a rapid speed. The statement can be proved by the fact that certified used car dealers over the last couple of years have increased their presence to double. Key players in the market like Shriram Automall; India’s largest & most trusted service provider for acquiring & disposal of second hand cars have set-up over 50 well structured Automalls pan India. Many other have also started to take the most out of this boom by opening city offices for this purpose. It’s a big bad elder cousin of Alto. This one features a bigger & better engine. Its design definitely looks bold which will attract a lot of people. Thanks to the 1.0 liter K-Series engine this one is more fun to drive around and the Maruti Suzuki tag ensures much required peace of mind. In our survey we were able to find decent options which were drove about 15000-25000 Kms within the price bracket of 2.5 Lakhs – 2.7 Lakhs easily. To our surprise most of them were in really good shape as well. The Honda Civic became everyone favorite since its launch. Everyone was mesmerized by its bold & muscular design. Over a period of time it started to lose its fame due to the stiff competition posed by competitors who offered similar features & design with more mileage. Due to the same reason its resale value fell to a huge extent & that’s the reason we are able to find this strong & efficient car within the price bracket. Hyundai i10 has been the company's one of the best selling hatchbacks in India ever since its launch in 2007. In terms of interior and city driving capabilities, the car is truly great. The i10 is offered in 1.1-litre petrol and LPG fuel versions, mated to a five-speed manual transmission gearbox. It has a four-speed automatic transmission as well on offer. This one surely is one of the most capable hatchbacks in recent times. Its performance in the market os fine but when we compare it with the competitors we find it struggling a bit. This is the only reason its resale value has fallen for both diesel & petrol version. It is also the only hatchback on this list to come with both petrol and diesel options which makes it a very good buy. How Shriram Automall Offers Best Deals For Used Two-Wheeler? Shriram Automall India Limited (SAMIL) adds utmost value to the exchange of pre-owned two-wheelers through its multiple solutions for customer needs. We, at SAMIL, cater to every type of two-wheeler and facilitate value-for-money transactions, ensuring maximum profit for our customers. With our exhaustive marketing activities, we formulate the best of deals in pre-owned two-wheelers. Our unique bidding platforms and allied services offer you holistic approach towards a successful acquiring and disposal. We have an extensive reach across India with 100+ bidding locations, including 40+ well-structured Automalls and 70+ strategic parking locations. We offer multiple bidding platforms, including physical bidding, online bidding, private treaty, micro-site and brand store for manufacturers & dealers. At SAMIL, we aim at building ever-lasting associations with our customers and maintain complete transparency on every bidding platform. Agriculture in India accounts 13.7% of the total GDP (Gross Domestic Product) of India & employees 50% of the total workforce. The main equipment we see when we of think agriculture is a tractor. It helps a farmer in carrying out majority of farm activities like harvesting, preparing of farms, plucking seeds etc. So today we bring you the most exiting tractor comparison for you. 1. John Deere 5050 D – This one is a super powerful tractor that runs on 50 horse power engines, 50 HP, 2100 RPM, 3 Cylinders. This one has been designed keeping the comfort and convenience features in mind to keep you smiling even during the longest days. 2. Mahindra 575 Di – this one is definitely driven by technical excellence & is high on performance & quality. Claimed by Mahindra it is thoroughly tested against various quality parameters by quality controllers. 3. Tafe 5245 Di – Tafe has always aimed at bringing high quality tractors for the Indian market. This one is definitely to look out for. With 50 HP & 2700 CC engine we put it on no 3 at our comparison. 4. Sonalika worldtrac 75 RX – The same sonalika has become a pillar of trust for farmers in India. The fact is proved by the high number of sale that they enjoy every year. Sonalika Worldtrac 75 RX is yet again a winner from it’s vary launch. It features a monster engine capacity; give farmers a huge lifting capacity of over 2500 KG. 5. New Holland - 3600-2TX 50 HP Cat Tractor – This one is yet another 50 HP tractor from the New Holland India. Featuring a really powerful engine & other useful features like anti-corrosive paint, Cerametallic clutch, oil immersed disc brakes etc., 3600 is really worth every penny you spend for it. Here you go guys our comparison to make your clear your vision to purchase a tractor. If you are looking forward to purchase used tractor than Shriram Automall India Limited (SAMIL) is the one stop destination for you. SAMIL offers the widest range of second hand tractors & other used construct ion equipment in the country, with a strategic presence of more than 50 Automalls Pan India SAMIL is at your doorstep to offer its professional services. 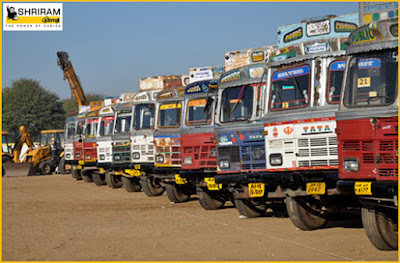 Shriram Automall India Limited (SAMIL) is a One Stop Platform for the exchange of pre-owned commercial vehicles. At SAMIL, we facilitate their acquisition and disposal on our multiple bidding platforms with complete solutions under a single roof. We follow a transparent and organised bidding process for every deal and ensure best price realisation on the pre-owned commercial vehicles acquired and disposed through us. Right from parking to disposal, we provide end-to-end services for every transaction. That’s how we define an ultimate acquisition and disposal experience at SAMIL for the pre-owned commercial vehicles. SAMIL offers a wide choice in pre-owned commercial vehicles through physical bidding, online bidding, one stop classified kiosks and private treaty. At SAMIL, we offer various allied services, including Refurbishment, Parking, Valuation, Easy Finance and General Insurance. SAMIL believes in maintaining complete transparency in its deals and offers value-for-money transactions. 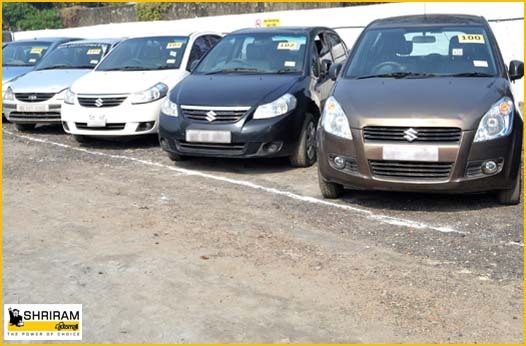 At SAMIL, we bring a wide variety of pre-owned commercial vehicles on our bidding platforms and ensure their transparent and organised exchange. What’s Exciting in the Exclusive Car Bidding Events at Shriram Automall? The Exclusive Car Bidding Events at SAMIL cater to a huge variety of pre-owned cars. 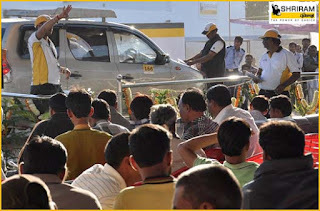 These events are conducted in a hassle-free manner at more than 150 bidding locations, including over 50 well-structured Shriram Automalls, across India. We create an engaging platform through such bidding events in which the customers get maximum benefit through an exciting acquisition and disposal process. All the cars are safely parked at bidding locations, two days prior to the bidding event. Interested bidders are given a suitable time for car inspection before an event begins. This helps them in making an appropriate decision during their participation in the events as we give them a transparent vehicles bidding platform for their valuable acquisition. At SAMIL, we ensure that every pre-owned car is disposed at best prices of the market. Customer profit is the main objective of our exclusive bidding events. Every event marks the presence of various bidders due to strategic locations of the Automalls. These numerous registrations further contribute in raising the value of car to a great extent. Shriram Automall India Limited (SAMIL) is one of India’s leading platforms to serve holistic solutions in the exchange of pre-owned cars and SUVs. At SAMIL, we cater to every type of pre-owned cars and SUVs on our multiple bidding platforms where the acquisition and disposal takes place in a hassle-free manner. Our Refurbishment, Parking, Valuation and other allied services add utmost value to every transaction. For any solution related to pre-owned cars & SUVs, SAMIL is like a one stop destination, built upon a commitment to customer value and satisfaction. With our 150+ bidding locations, including over 50 well-structured Automalls and more than 70 strategic parking locations, we reach out to India’s every corner. We provide multiple bidding platforms for used vehicles in India, including physical bidding, online bidding, private treaty and one stop classified kiosks for pre-owned cars & SUVs. At SAMIL, we ensure utmost transparency at every step of our association with the customers in order to serve them value-for-money transactions. It takes a lot of hard work for India to make dreams within pockets. What if there was some magic wand to make every dream within pocket reach? For example, the dream of buying a vehicle of your own! Now, that’s something which all of us desire at some or the other point of time in our lives. Shriram Automall is one such place through which you can actually live your dreams. 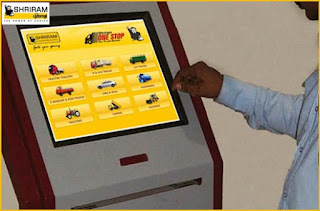 It has this very exciting service called Easy Finance, under which it supports the dreams of its patrons while serving them complete financial assistance through Shriram Transport Finance Company (STFC) – India’s largest Small Business Finance Company (SBFC). For its esteemed buyers this service is made applicable on their single as well as bulk buying needs. While serving up to 100% finance on the day of bidding event as well, it also enhances the probability of its product disposal. You don’t have to get stuck in a confusing and highly tiring finance process. Everything is just so simple here. Documents will never be a headache if your wish to get your second hand vehicle financed here. You can also pay EMIs as per your convenience. The disbursement process is extremely quick here. It will definitely serve your purpose on time. Online Bidding – Anytime From Anywhere! Online Bidding is a new-age bidding platform created to fulfill needs that arise at Anytime from Anywhere! Keeping pace with India’s fast track growth, Shriram Automall brings you the most exciting space on new media where every dream is just a click away. There, it provide its customers the most convenient way to view, bid & own or dispose pre-owned vehicles and equipment, through state-of-the-art online transaction platform. A large stock of inventory is listed on a dedicated website, bids.samil.in, for customers to make the right choice. • Call 1800 102 4141 & Take Free Online Training. Rainy season is on its way now & while most of us will definitely enjoy it but the bike riders now will have to find a place to hide when it starts to rain. Delhi has already shown its true monsoon face last week. To be safe & reach our offices on time the existing bike riders & metro commuters will love to transform themselves into a car owner. Today we bring you the simplest way to exchange your used bikes with a pre-owned car in Delhi. 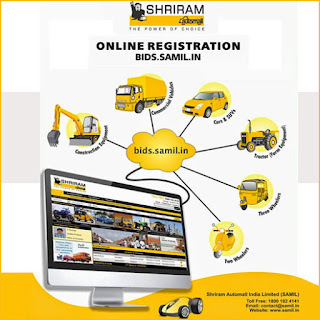 The age old trusted phenomenon of bidding has been given a new shape by Shriram Automall India Limited (SAMIL) to acquire or dispose of used vehicles or equipments. A country wide presence with global knowledge & strategy SAMIL has come to your door step in Delhi. With three well structured Automalls located in Delhi NCR you now have the access & complete transformation power. Just walk in to any of your nearest Automall to have a look at the widest range of second hand cars in Delhi. You will be delighted to find almost every brand’s cars available for disposal at competitive price. Your bidder book supplied after registration will help you to inspect the line up physically & have a deeper insight about the used car. Being active is the key to emerge as a highest bidder once your selected vehicle is being ramped. You can submit the remaining payment in a week time or can opt for the easy finance option provided by Shriram Transport Finance Company. SAMIL in association with STFC is marching strong to help our customer own their dream vehicle overcoming the financial crunches. Shriram Automall is India’s most trusted platform for safe disposal of all used vehicle & equipments. We follow the most transparent process & help our customer in realizing the best market price for their pre-owned vehicle & equipment. So, no more wait to own used cars in delhi, get register with Shriram Automall and bid on your choice of pre-owned cars and crack that smart deal. 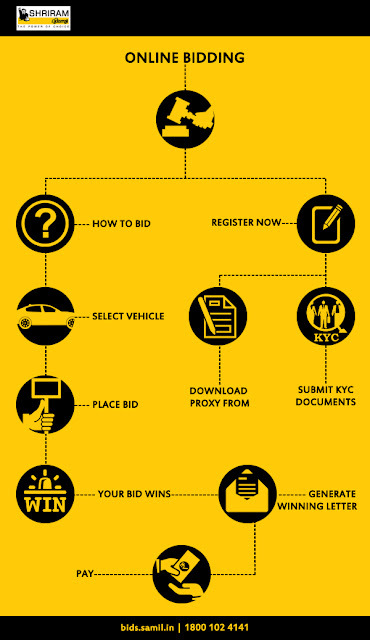 This Info-graphic will take you through the process of getting yourself registered to bid for your dream pre-owned vehicle. It will also through light on the bidding process & steps to follow to be a successful bidder for the day. Shriram Automall is the undisputed leader for safe disposal of pre-owned vehicles in the country including, used trucks, cars, bikes & used construction machinery. SAMIL has been given AA ratings by CRISIL. Excavators is one of the most used construction machinery today & as a construction business owner you should be well verse of all the available excavator options in the market & which one to choose. Today we bring you a list of top 4 excavators available. JCB JS205LC – This one is one of the best in its range giving maximum performance output comfort, efficiency & productivity. This one certainly ensures low noise level, highest productivity and excellence in doing any application. Cat 320 EL – The cat 301 7D excavator provides you with good options with good working advantages like more digging depth, power, great reach, more lift capacity & more. 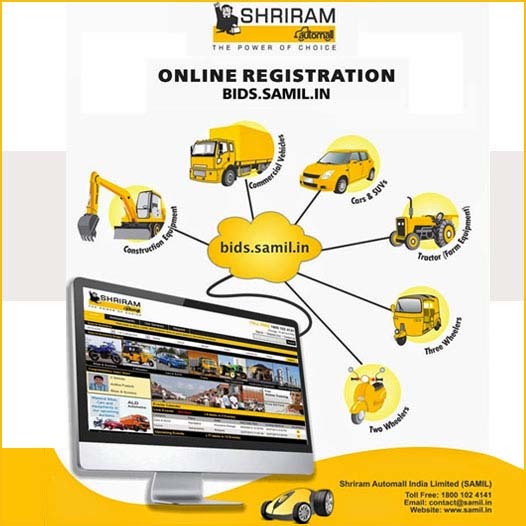 If you are looking to buy a used excavator or any other used construction equipment than Shriram Automall India Limited SAMIL is the right place for you. 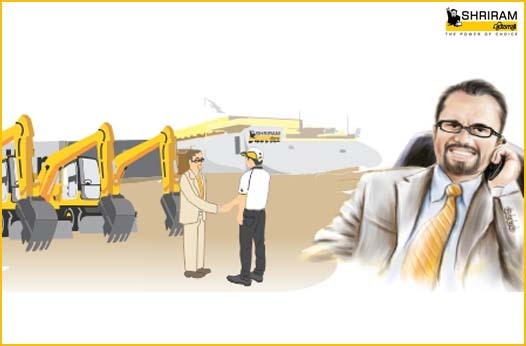 SAMIL offers the widest range of excavators in the entire country to choose from at a very competitive price.